Thinking of booking the Adaaran Prestige Vadoo for your next trip to the Maldives? 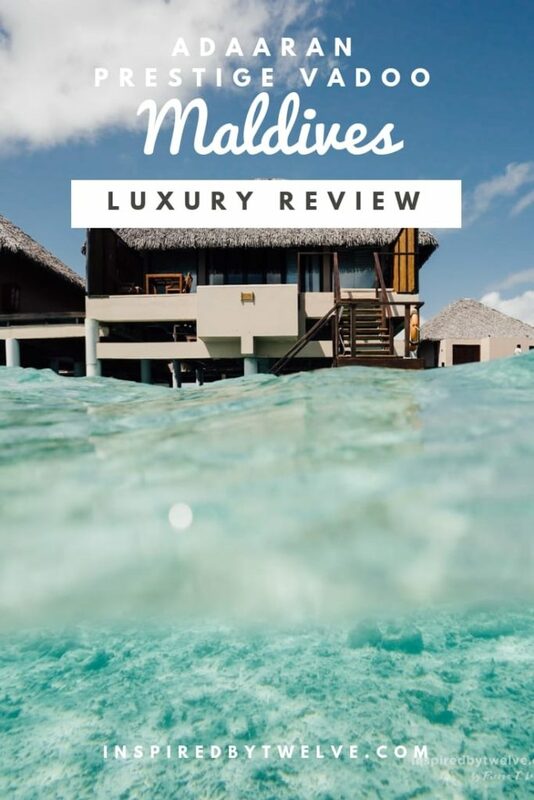 Here is a complete run down of our 3-night stay at the luxury resort only 25 minutes outside of Male. 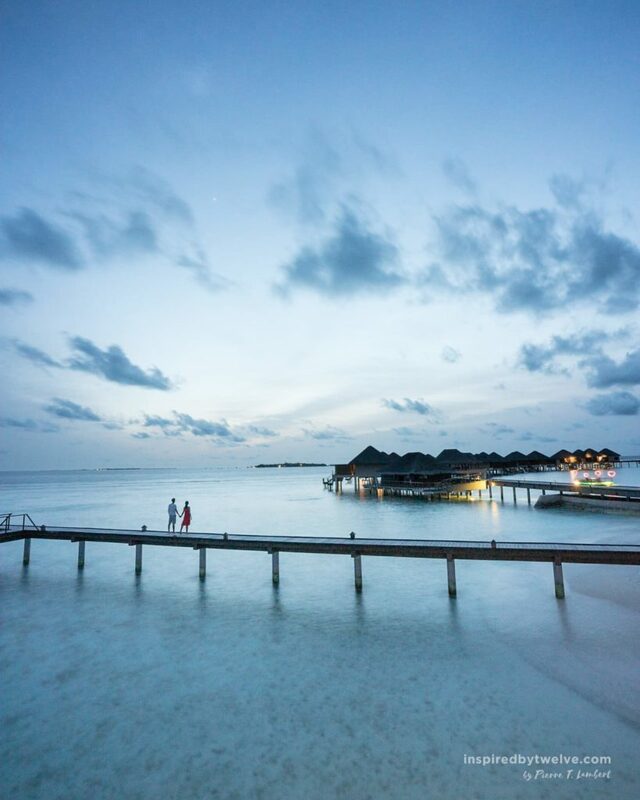 As part of the last leg of our 12 Country x 12-month journey around the world, Pierre and I had the privilege of visiting the Maldives for the second time. Our first visit was in 2015 to celebrate our honeymoon. I remember researching the internet for hours to find the perfect resort. We ended up booking a resort based on the word-of-mouth recommendation of a friend. This time around, we were invited by the wonderful team at Adaaran Resorts to experience two of their resort islands. Our first stop, the Adaaran Prestige Vadoo! We visited two resorts from the Adaaran Resort Collection. Our first resort was the Prestige Vadoo which I selected based on villa amenities, 5-star service level, and proximity to Male. Arrival – Communication with the reservations team started as soon as we completed our booking. In order to ensure smooth transport to the resort, you will need to provide the team with all your flight’s details. Since our flight landed late at night, we stayed in Hulhumale for a night. This is very common for most people who travel to the Maldives. 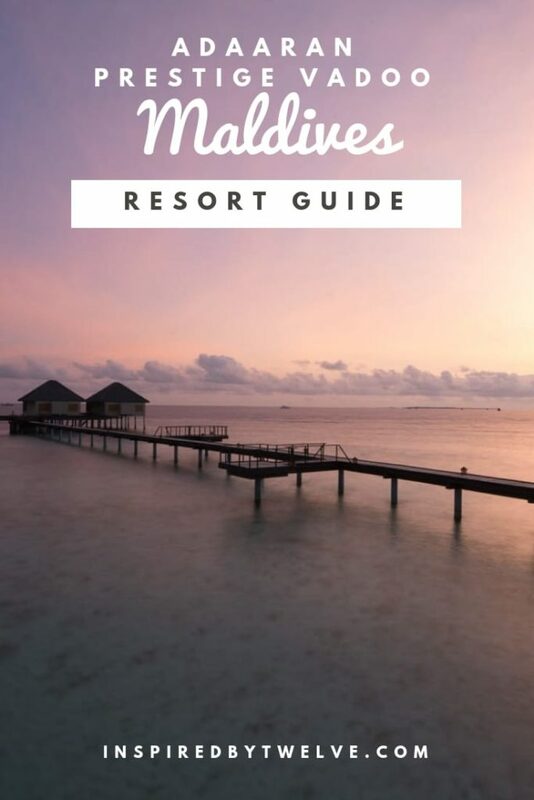 (For more information, see our First Timer’s Guide to the Maldives here.) When we arrived at our hotel in Hulhumale, we found out that the Adaaran team had already contacted the hotel to inform the hotel of our departure time the next day. Very efficient! 5* Star Service – In less than 20 minutes by speedboat, we arrived at the resort. Upon arrival, we were shown to our Water Villa by our very own private butler. Yes, every water villa comes with Butler Service! Our butler’s name was Midhun, and he made our stay truly memorable. He helped to organize everything we needed from small room requests such as extra nuts and jacuzzi decoration to a private dinner on the beach one evening. Whenever we needed anything, Midhun was there to help. The Ocean Villa – Let’s get something straight. 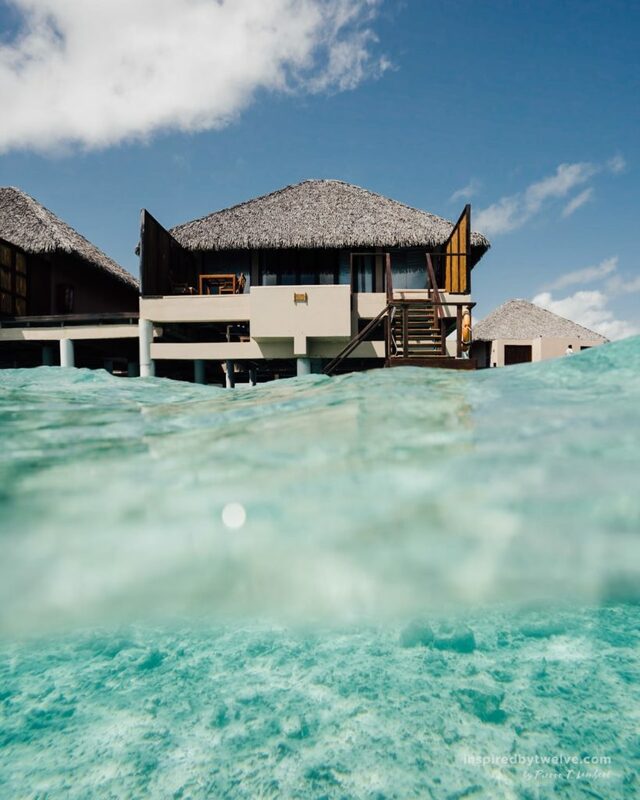 Not all ocean villas are created equal. The ocean villas at the Prestige Vadoo have jacuzzis installed in the open-air section of the private bathroom in the back of the villa. This is completely cut-off from the view of the public. In addition to this, the ocean villas have their own dipping pool which is great for taking a quick freshwater dip when things heat up during the day. Of course, the best part of the ocean villa is having access to the ocean literally at your doorstep. This truly is part of the Maldivian resort experience so I would highly recommend this type of accommodation for anyone who is having doubts. It’s a once in a lifetime experience so you might as well go all in! The Grounds – While it may be tempting to hang around your Ocean Villa all day (which is completely acceptable! ), we do recommend taking a quick walk around the island. It’s only 2km in size so the walk is pretty quick. If you feel like doing something a bit more sportive, we recommend heading to the water sport center and renting a SUP board. This was a great way to take a tour of the island. Walking around the resort, you’ll also find plenty of spots for that perfect photo to share on Instagram or with your friends back at home. This is your time to play around, have fun, and yes why not pretend to be a super model for 5 minutes! 1. 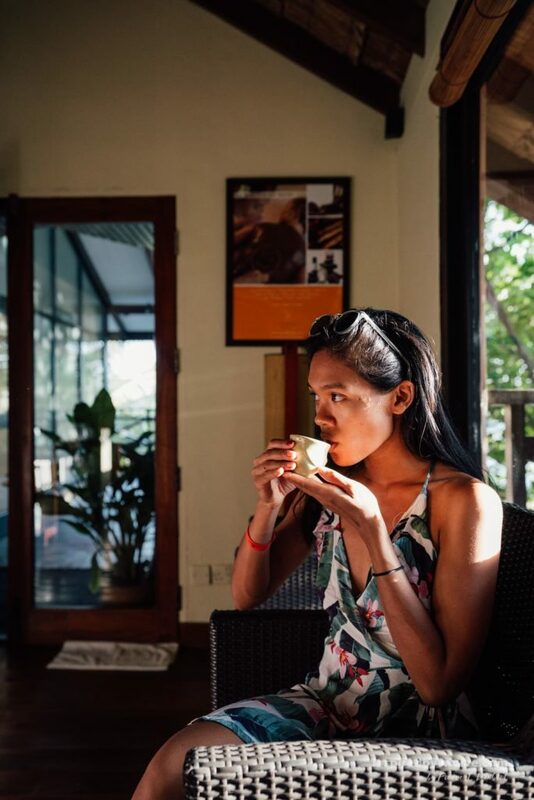 BREAKFAST – Try and have breakfast in your room at least once during your stay. Breakfast was by far our favorite meal at the Adaaran Prestige Vadoo, specifically their Indian & Maldivian options. Of course there are western options available for you to choose from, but we figured we would try something different while visiting a new country. 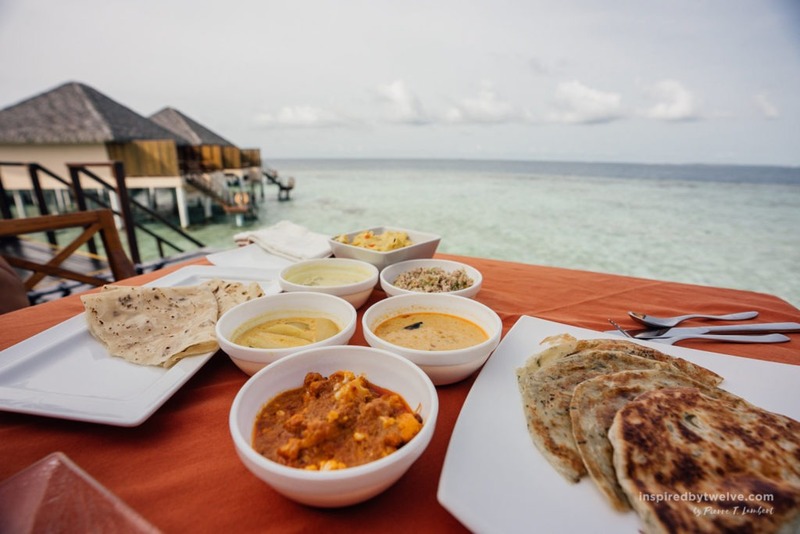 We were not disappointed and ended up having the Indian & Maldivian breakfast everyday during our stay. Something to note about the meal options at the Adaaran Prestige Vadoo. The all-inclusive option includes your choice of set menu options for breakfast, lunch, and dinner. The menu changes daily so you don’t have to worry about repetitiveness, and you’ll have around 3-4 set menu choices to choose from per meal. If you’re looking for more of a daily buffet style service, the Adaaran Hudhuranfushi has a great selection. 2. 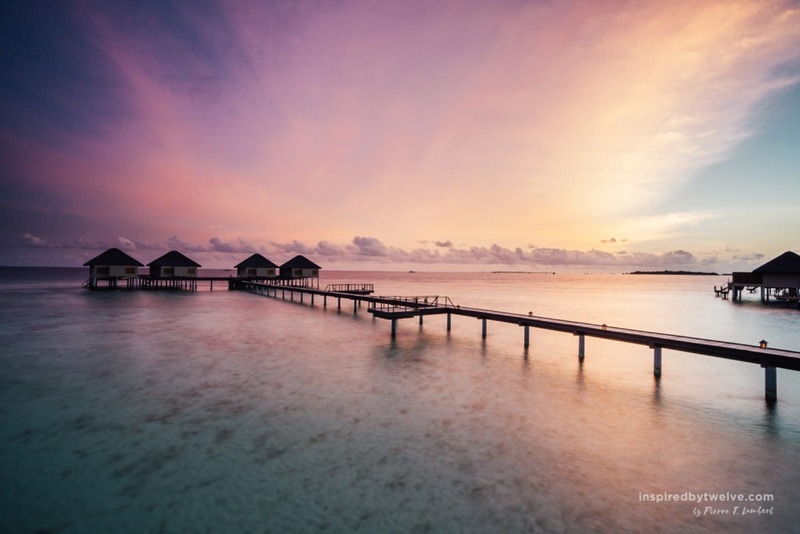 SPA TREATMENTS – During our first trip to the Maldives, I remember contemplating whether we should invest in a spa service. The answer is simple. If it’s within your budget, it’s completely worth it. 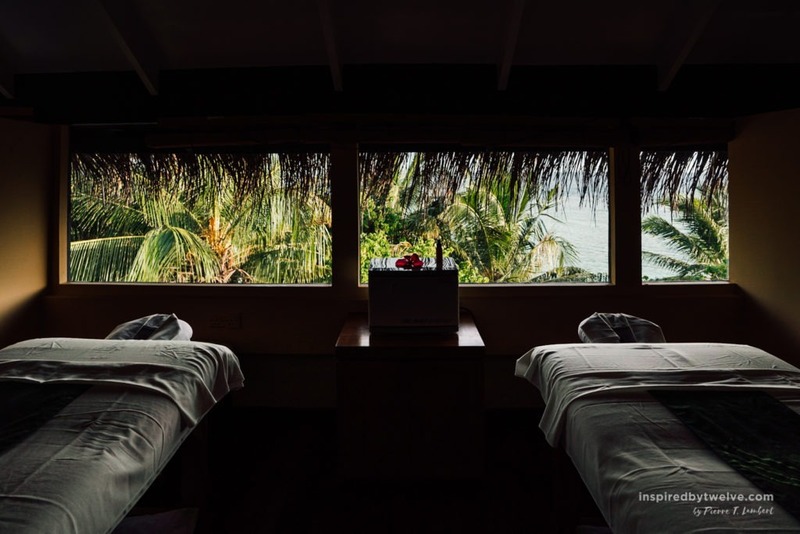 Imagine unwinding at the end of the day to a nice relaxing couple’s massage. This is a great way to elevate your luxury experience during your special getaway. Also, don’t forget to ask for special deals for treatments. 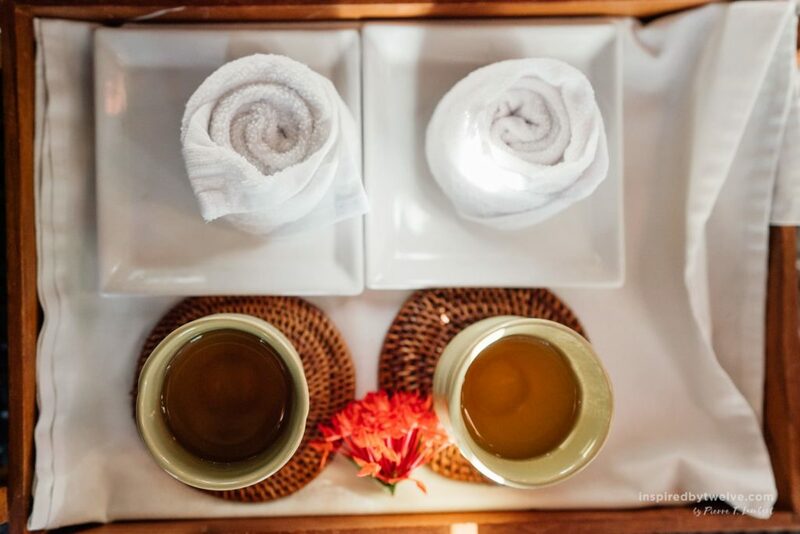 For example, many of the resorts offer welcome specials on treatments. 3. SUNSETS – The third thing that you must experience while at Adaaran Prestige Vadoo happens to be completely free. You simply need to make sure to be outside a little before sunset hour. Our favorite spot for catching the sunset was near the welcome area on top of the patio bar. The below sunsets were captured around the same location on two different days. We were lucky to capture such beautiful and diverse sunsets during our stay. 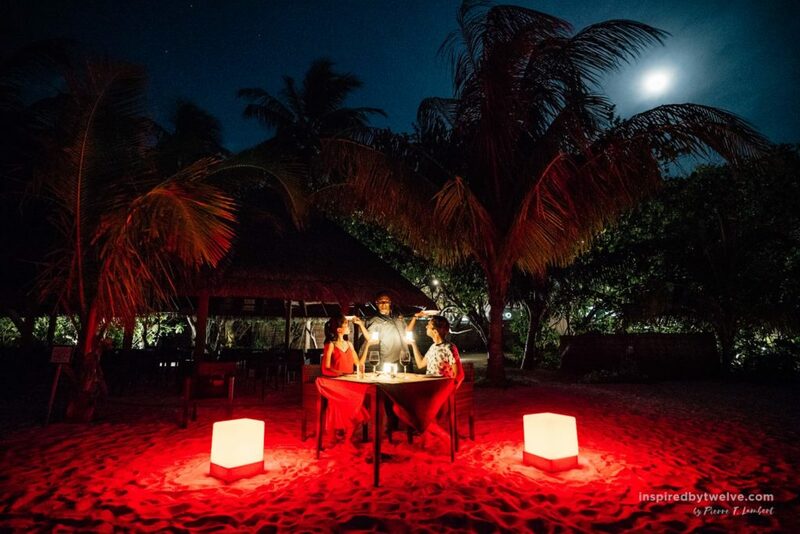 A great way to complete your evening after catching the sunset would be to enjoy your very own private dinner on the beach. Our butler Midhun helped to organize our dinner menu that evening mainly based on seafood. We had such a delightful time eating outdoors on the beach and getting to know Midhun a bit more. As we are heading to India after the Maldives, Midhun was able to provide some good advice to us as he is from the area of Kerala. 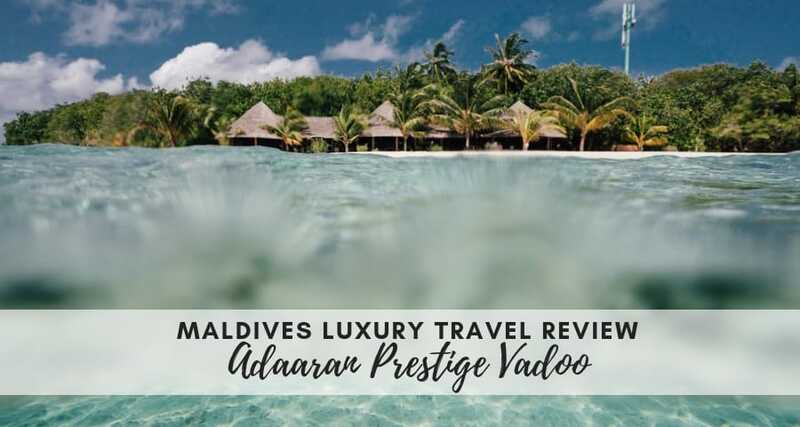 Other Considerations: Beyond the 5-star service that comes with having your own personal butler, the 2nd biggest incentive for coming to the Adaaran Prestige Vadoo is the ease (and cost) of getting to the island. Since the island is located only 2km away from Male, it only takes a 20 min speedboat to get to the island. The transfer cost of the speedboat ($260 USD per couple) is considerably less than a private seaplane transfer which can add up to an additional $700 USD per couple. Check the prices for the Adaaran Prestige Vadoo here. We would like to give a huge shout-out and thank you to the entire team at Adaaran Resorts for helping to organize this trip and make it a reality. As always, all opinions in the post and review are our own.